This personalized print casts your favorite child as a brave storybook figure. Cast your favorite little person as a fearless literary figure--whether a newborn making a debut or a young child in the first few pages of his or her heroic tale--with this delightfully personalized print, featuring a custom, storybook-inspired illustration and your custom rave "review." For newborns, it's an imaginative antidote to ordinary birth announcements; for young children, it commemorates the magical story of early childhood. For more storybook titles, check out our Personalized Storybook Art - Adventure, Personalized Storybook Art - Legend, and Storybook Art - Amazing. 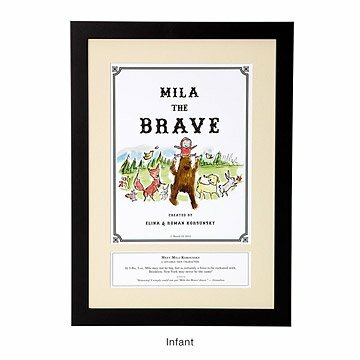 Inspired by classic children's literature illustrations, our Personalized Storybook Art - Brave, illustrated by Patricia Carlin, offers creative portrayals of children as adventurous, timeless characters. Playful details like relatives' "review" of the child's debut and their birthday as "copyright" make this keepsake a truly individualized expression of a child's character, and a distinctive birth announcement or toddler tribute to be treasured for years to come. The Personalized Storybook Art - Brave is packaged in a partially recycled and fully recyclable/compostable box. There's one place—and only one place—where you'll find the Personalized Storybook Art - Brave: UncommonGoods. favorite piece of nursery art! Love seeing this on my daughters wall.. I'm so excited to be able to show her her own special piece of art when she's bigger! We get tons of compliments on it too! Reading is super important and we've made this a part of her reading area in her room! New parents were thrilled with the poster. Gift for newborn baby--the first child for these parents. Clever and amusing and, hopefully, something that will inspire. This was a beautiful way to honor our grandson's birth. I have difficulty finding the right gift for my autistic grandson, and this was the perfect statement of my love for him. He recognizes his name and mine as "Nana" and can see it every day as a reminder of how proud I am of him.